What is a Mohs Procedure? 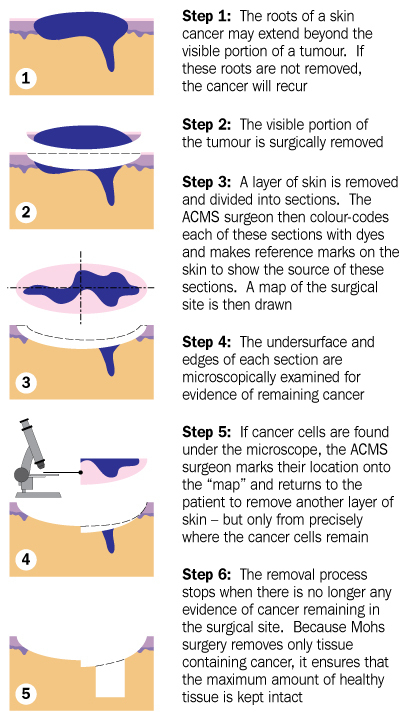 A Mohs procedure, or Mohs micrographic surgery, is a surgical technique used to treat skin cancer. 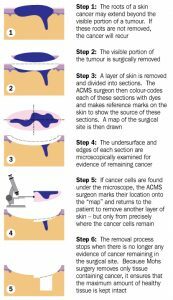 It is a precise surgery in which thin layers of cancerous skin are progressively removed and examined until all of the cancerous tissue is removed and only cancer-free skin remains. During Mohs surgery, the goal is to damage the healthy skin as little as possible while removing as much of the skin cancer as possible. Our office does the Mohs procedure on an outpatient basis using a local anesthetic. Traditional surgery for skin cancer involves removing the visible cancer and a small margin of surrounding healthy tissue. The Mohs procedure includes verifying that all of the cancer has been removed, as the procedure is effected, which guarantees that all cancerous tissue has been removed during the surgery. This heightened level of certainty increases the likelihood of being cured of the skin cancer. Mohs is typically used to treat basal cell carcinoma, squamous cell carcinoma, and some types of melanoma or other skin cancers. The Mohs procedure is very effective for skin cancers that are in areas where one would want to preserve as much healthy skin tissue as possible, such as on the face and extremities. Additionally, the procedure is very helpful for skin cancer with borders that are difficult to define or cancers that are large and/or aggressive. If you have skin cancer and would like to discuss treatment options, or if you are concerned about an area of your skin, please contact our office for an appointment.